Art lovers will have a chance to experience the unique voice of San Francisco’s Wanxin Zhang. His ceramic sculpture works embody his cultural lineage—Zhang moved here from China many years ago—but it is interpreted in the context of the 21st century Western world, the United States in particular. “The Works of Wanxin Zhang” will open in the Main Gallery of Sanchez Art Center on Friday, July 12, with a reception from 7 to 9 pm. Music will be provided by the Chinese Instrumental/Vocal Ensemble, with Mr. Yu, erhu (violin); Mr. Ma Zhong, hu (viola); Mr. Zhao, Chinese banjo; and Prof. Wilma Pang, lead vocalist. Zhang’s work speaks to the enduring societal issues of power and oppression; and cultural hegemony and the need to express one’s individual selfhood. For example, when Zhang visited the Terra Cotta Warriors of the Qin excavations, he was immediately aware that “the concepts of feudalism and oppression have never stopped controlling the people in China.” His meditative life-sized figures created in response to the Terra Cotta Warriors seem to be made with love, humor, and a balance of despair and hope, a vision saying that human social interactions are indeed centrally important, and we can improve. Zhang’s pieces are rough-hewn, with broadly slabbed surfaces that gently open a connection to our human imperfection even amid our virtues. His life-sized ceramic figures, created in response to the Terra Cotta Warriors, have huge mitts of hands, lumpen feet, and unkempt clothing, a far cry from the smoothly detailed original warriors, but equally as impressive. Wanxin Zhang was born and educated in China. 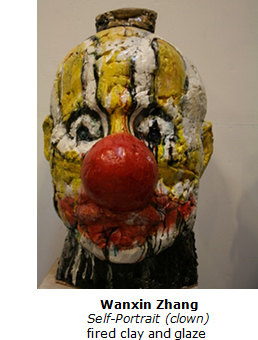 He graduated from the prestigious LuXun Academy of Fine Art with a focus in sculpture. In 1992, after Wanxin Zhang established his art career as a sculptor in China, he and his family relocated to San Francisco, where he received his MFA from the Academy of Art University. 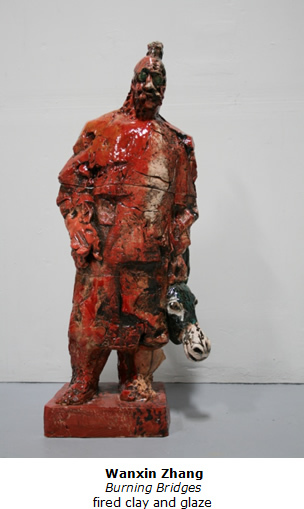 Zhang was influenced by other ceramic artists in California, such as Bay Area funk and figurative artists such as Robert Arneson and Peter Voulkos. 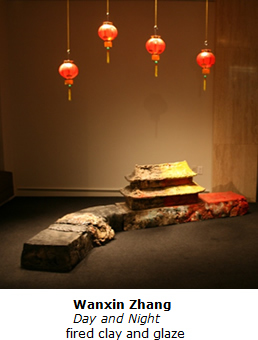 As a studio sculptor and educator, Zhang is a first-place recipient of the Virginia A. Groot Foundation Grant in 2006, and the Joan Mitchell Grant in 2004. His sculptures have been shown in San Francisco, New York, Seattle, Santa Fe, and Miami, as well as abroad in Japan, China, and Canada. Zhang has had many solo museum exhibitions, and his work can be found in both public and private collections nationally and internationally. His works were included in Judith Schwartz’s book on Confrontational Ceramics, and have been featured in major art magazines. 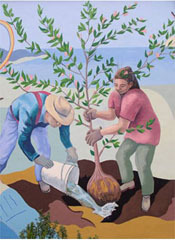 Zhang currently lives and works in San Francisco, and is a lecturer at the Department of Art Practice at UC Berkeley.